I moved to upper Manhattan (north of 200th street!) earlier this year to be closer to campus, and haven’t had much time for sewing since then — in part because I’ve been teaching two classes this fall and reading for my comprehensive (qualifying) exams, and in part because my sewing machine doesn’t fit in my new apartment. I know. I don’t have space for my sewing machine! Welcome to living in Manhattan. At least it’s still with my parents, in Brooklyn, and I can visit them (and it) from time to time. And that’s exactly what I did this past weekend! I had a sewing vacation for a day and a half, and now I have something to post about. 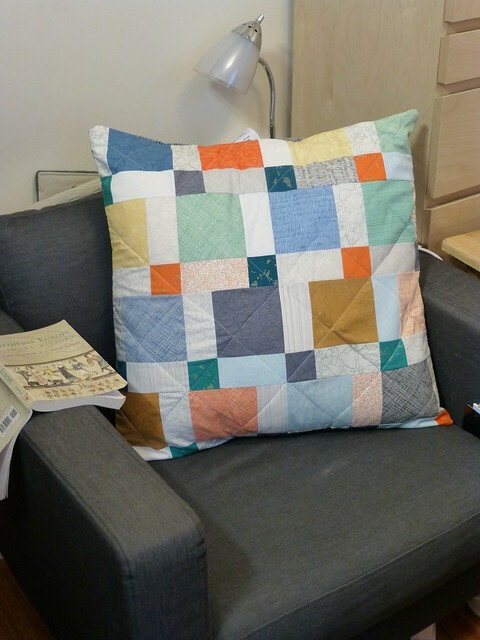 This is a pillow made from a patchwork square I made a few months ago. 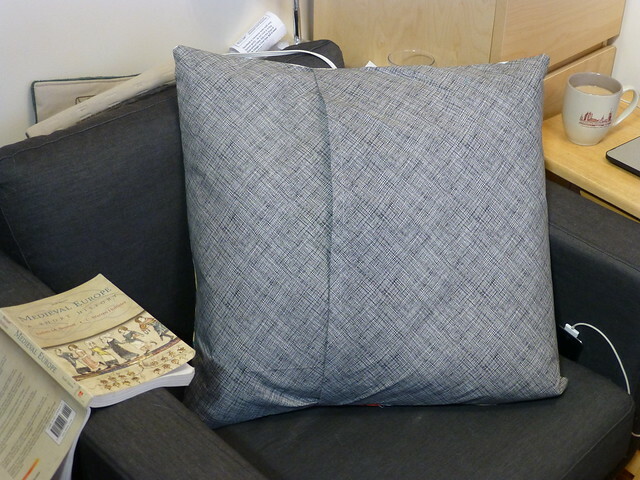 Its origin was a charm pack of Botanics fabric, which I sewed together using a modified disappearing nine-patch pattern. 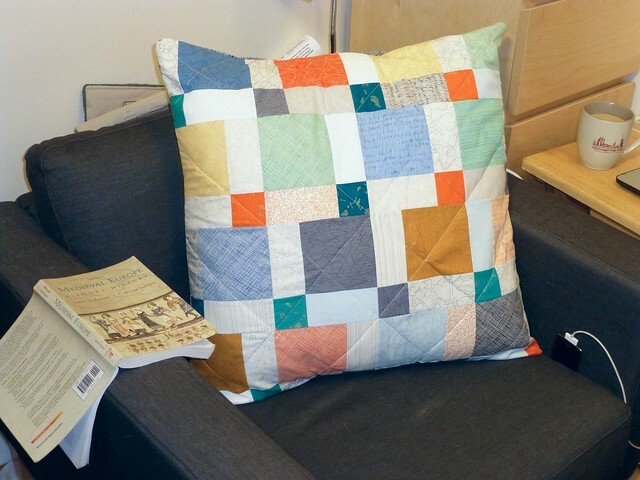 I love this fabric line, and I have a half-yard bundle of it, which I am seriously contemplating making into a quilt along these same lines, because this pillow just makes me happy. The back is a simple envelope closure, and I used a black cross-hatch from the Botanics line to finish it, because I had the fabric, and I’m trying hard to *use* my fabric, rather than worry about whether this is the “right” project for it — if it will make me happy, and make the project better, I’ll use it. Maybe there’s a hypothetical project out there somewhere in the future for which it would be “better” — but there will be more fabric in the future, and if I never use it, it will only sit around gathering dust. I was surprised by how much I have missed sewing: I’ve been doing a lot of spinning and knitting, but this was soothing in a different way. While I was at home, I also took part of a penny patch quilt I’d been working on and repurposed part of the quilt top into a baby quilt, which I’ll post about as soon as I’m done binding it. 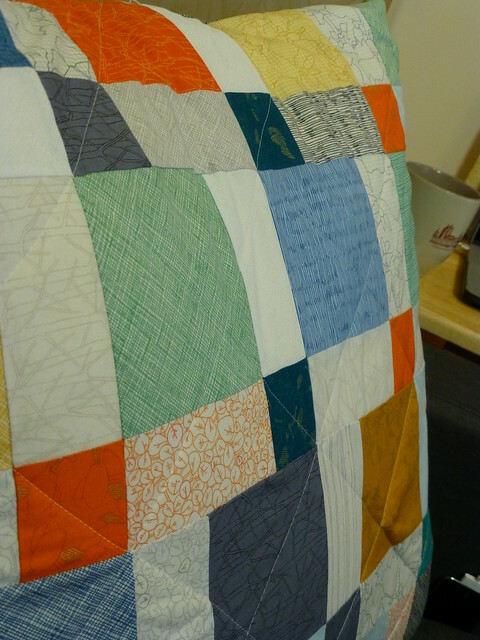 Previous Previous post: Spinning more, quilting less. Next Next post: Resurfacing with an announcement: KnitSpinQuilt on Etsy!